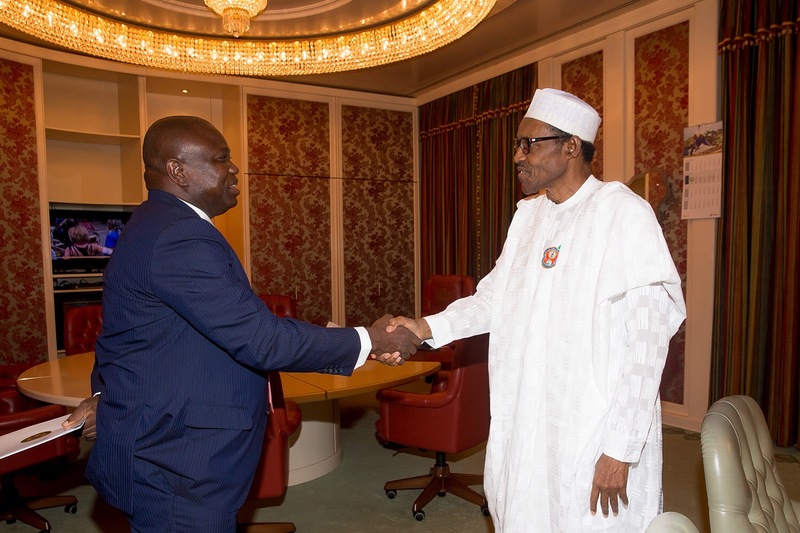 Governor Ambode who spoke to State House Correspondents shortly after the visit expressed high optimism that the President’s trips would in no time begin to yield benefits in the interest of all Nigerians. The Governor specifically commended President Buhari for his purposeful leadership to restore the nation’s place in the comity of nations, saying his recent trip to China and the profitable discussions will go a long way to move Nigeria forward, including Lagos. Lagos State Governor, Mr. Akinwunmi Ambode, addressing the State House Correspondents shortly after his meeting with President Muhammadu Buhari, at the State House in Abuja, on Friday, April 29, 2016. 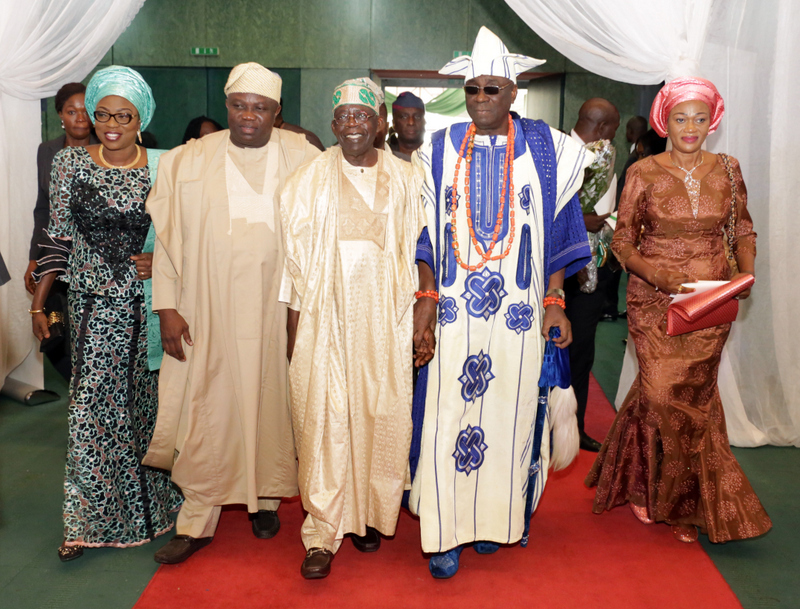 L-R: Wife of Lagos State Governor, Mrs. Bolanle Ambode; Governor of Lagos state, Mr Akinwunmi Ambode; celebrant, Asiwaju Bola Ahmed Tinubu; Oba of Lagos, HRM Oba Rilwan Aremu Akiolu 1; & Sen. Oluremi Tinubu, during the 8th Annual Bola Tinubu colloquium, with the theme; Agriculture: Action, Work, Revolution, as part of activities to celebrate the 64th birthday of Asiwaju Bola Tinubu, at the International Conference Centre, Abuja, on Tuesday, March 29, 2016. 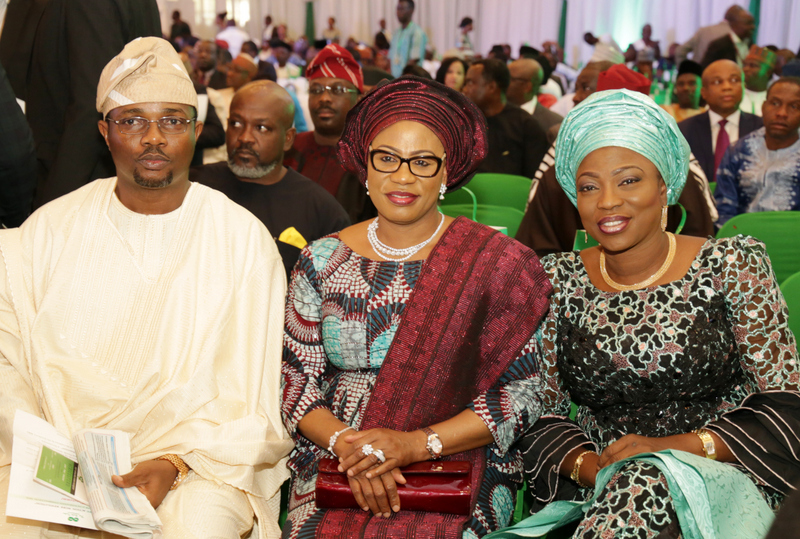 R-L: Wife of Lagos State Governor, Mrs. Bolanle Ambode; Wife of Osun State Governor, Mrs Sheri Aregbesola, (middle); and Husband of Lagos State Deputy Governor, Mr Saidi Adebule, during the 8th Annual Bola Tinubu colloquium, with the theme; Agriculture: Action, Work, Revolution, as part of activities to celebrate the 64th birthday of Asiwaju Bola Tinubu, at the International Conference Centre, Abuja, on Tuesday, March 29, 2016. 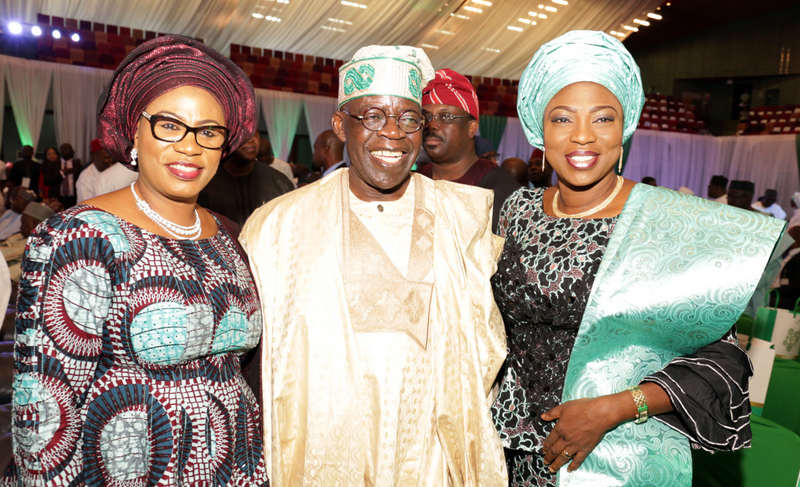 R-L: Wife of Lagos State Governor, Mrs. Bolanle Ambode; Celebrant, Asiwaju Bola Ahmed Tinubu; and Wife of Osun State Governor, Mrs Sheri Aregbesola (Left), during the 8th Annual Bola Tinubu colloquium, with the theme; Agriculture: Action, Work, Revolution, as part of activities to celebrate the 64th birthday of Asiwaju Bola Tinubu, at the International Conference Centre, Abuja, on Tuesday, March 29, 2016. 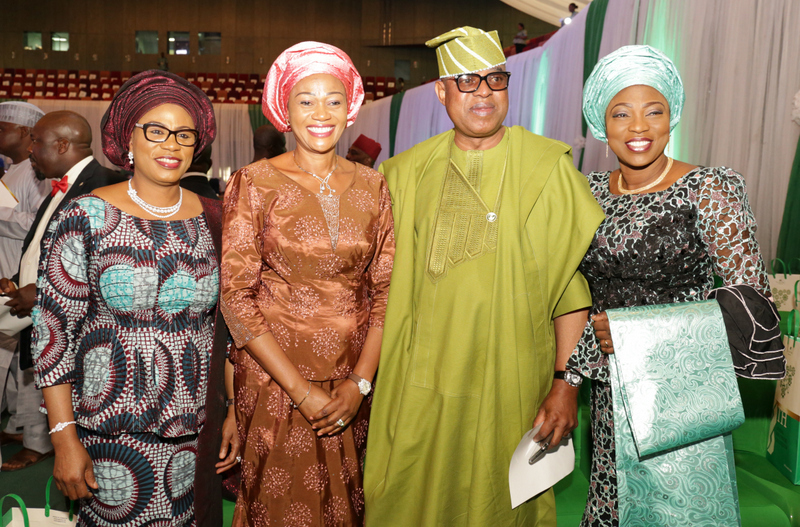 R-L: Wife of Lagos State Governor, Mrs. Bolanle Ambode; Sen. Gbenga Ashafa (2nd right); Sen. Oluremi Tinubu (2nd left); and Wife of Osun State Governor, Mrs Sheri Aregbesola (Left), during the 8th Annual Bola Tinubu colloquium, with the theme; Agriculture: Action, Work, Revolution, as part of activities to celebrate the 64th birthday of Asiwaju Bola Tinubu, at the International Conference Centre, Abuja, on Tuesday, March 29, 2016. 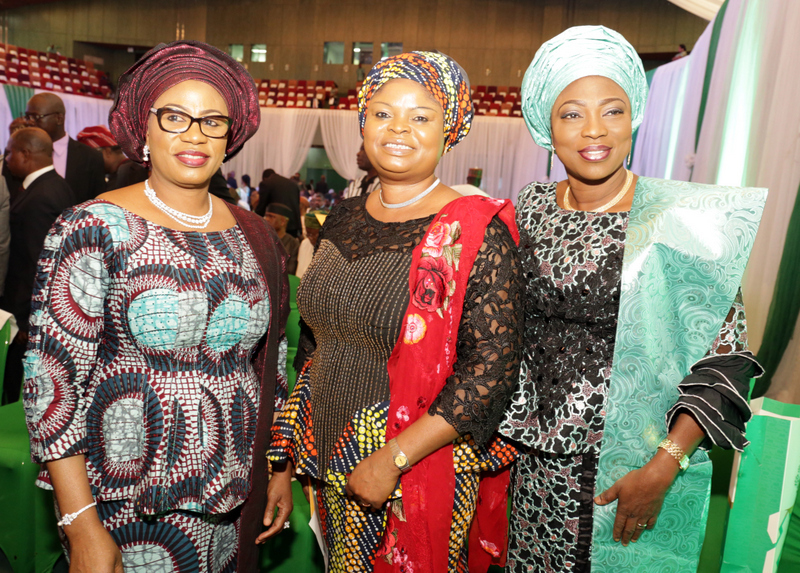 R-L: Wife of Lagos State Governor, Mrs. Bolanle Ambode; Wife of the Minister of Solid Mineral, Erelu Bisi Fayemi; and Wife of Osun State Governor, Mrs. Sheri Aregbesola, during the 8th Annual Bola Tinubu colloquium, with the theme; Agriculture: Action, Work, Revolution, as part of activities to celebrate the 64th birthday of Asiwaju Bola Tinubu, at the International Conference Centre, Abuja, on Tuesday, March 29, 2016. 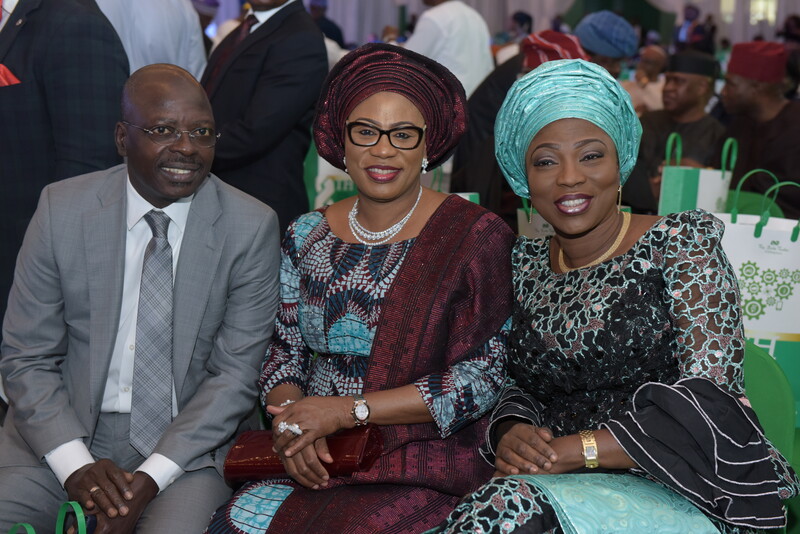 R-L: Wife of Lagos State Governor, Mrs. Bolanle Ambode ; Wife of Osun State Governor, Mrs Sheri Aregbesola; and Hon Rotimi Agunsoye, during the 8th Annual Bola Tinubu colloquium, with the theme; Agriculture: Action, Work, Revolution, as part of activities to celebrate the 64th birthday of Asiwaju Bola Tinubu, at the International Conference Centre, Abuja, on Tuesday, March 29, 2016. 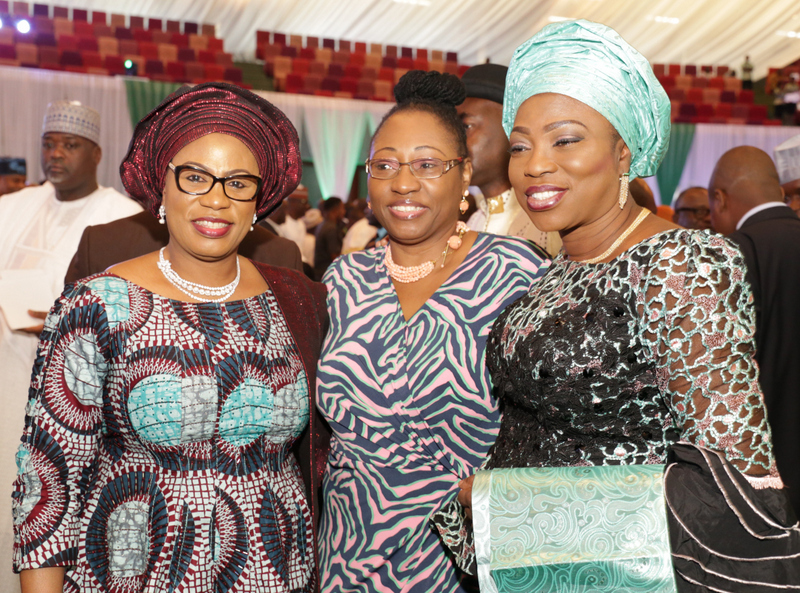 R-L: Wife of Lagos State Governor, Mrs. Bolanle Ambode; fmr Lagos State Deputy Governor, Mrs Adejoke Orelope Adefulire; and wife of Osun State Governor, Mrs Sheri Aregbesola, during the 8th Annual Bola Tinubu colloquium, with the theme; Agriculture: Action, Work, Revolution, as part of activities to celebrate the 64th birthday of Asiwaju Bola Tinubu, at the International Conference Centre, Abuja, on Tuesday, March 29, 2016. 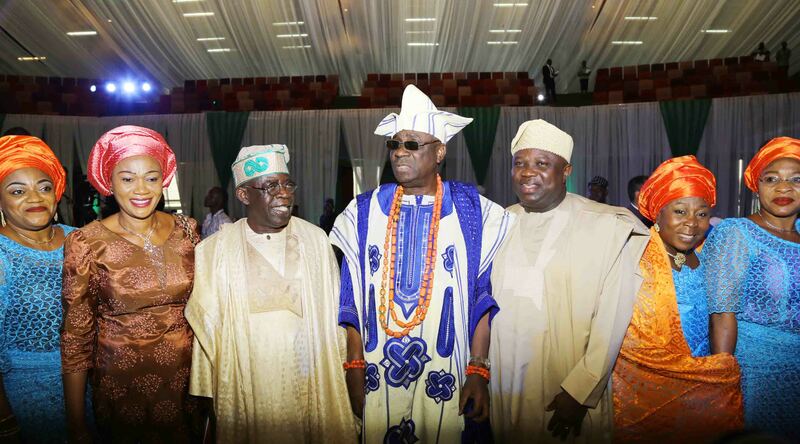 R-L: Lagos State Governor, Mr. Akinwunmi Ambode, Oba of Lagos, Oba Rilwan Akiolu I; the Celebrant and National Leader of the All Progressives Congress, Asiwaju Bola Tinubu and his wife, Senator Oluremi during the 8thBola Tinubu Colloquium as part of activities to mark Tinubu’s 64th Birthday at the International Conference Centre, Abuja, on Tuesday, March 29, 2016. 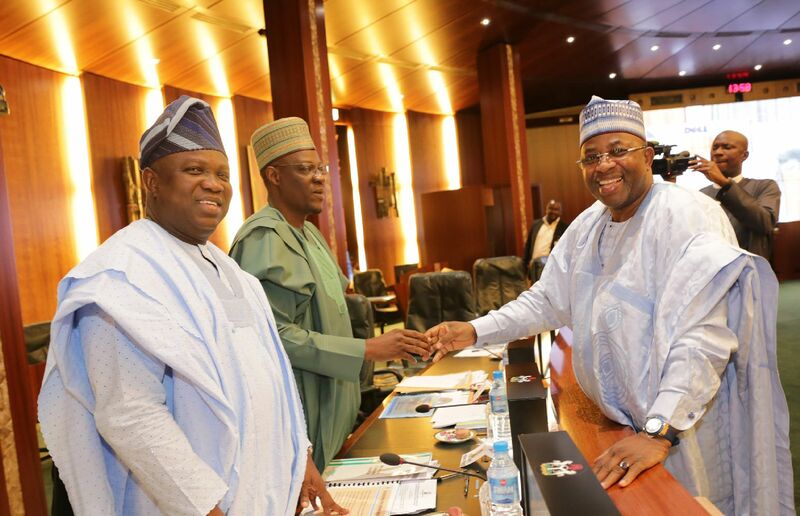 L-R: Lagos State Governor, Mr. Akinwunmi Ambode, with Niger State Governor, Alhaji Abubakar Sani Bello; Bauchi State Governor, Barr. 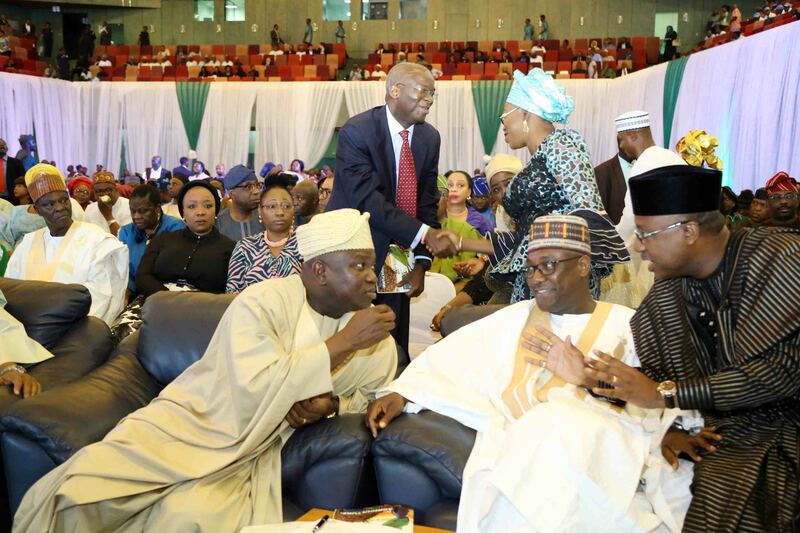 Mohammed Abubakar and Oyo State Governor, Senator Abiola Ajimobi during the 8th Bola Tinubu Colloquium as part of activities to mark Tinubu’s 64th Birthday at the International Conference Centre, Abuja, on Tuesday, March 29, 2016. L-R: Lagos State Governor, Mr. Akinwunmi Ambode, discussing with his Niger & Bauchi States Governors, Alhaji Abubakar Sani Bello and Barr. 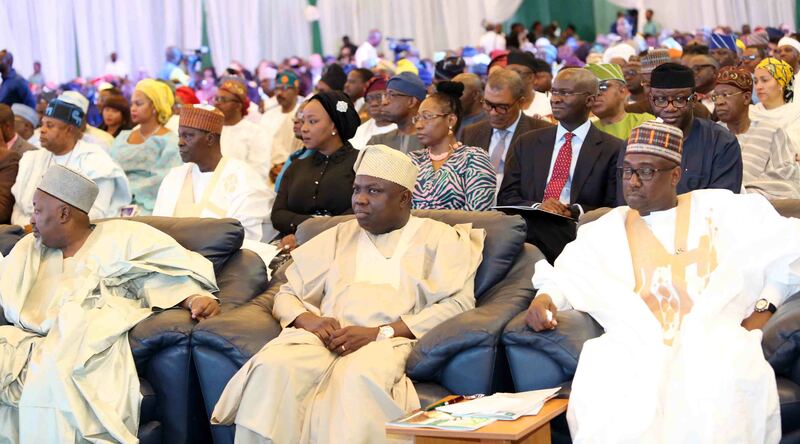 Mohammed Abubakar during the 8th Bola Tinubu Colloquium as part of activities to mark Tinubu’s 64th Birthday at the International Conference Centre, Abuja, on Tuesday, March 29, 2016. 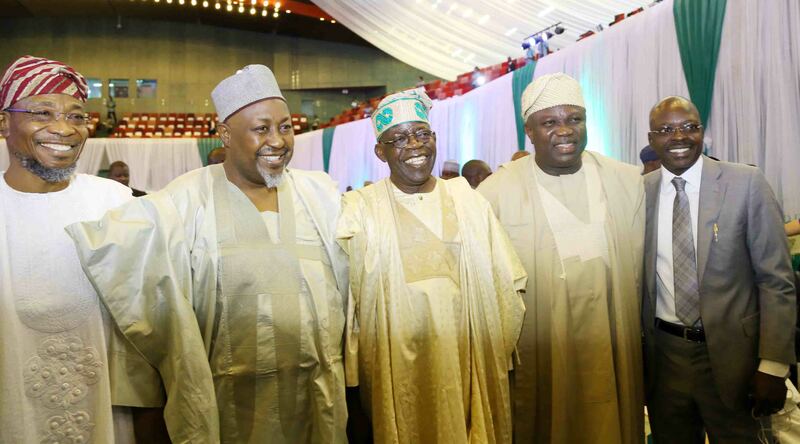 Lagos State Governor, Mr. Akinwunmi Ambode(middle); Niger State Governor, Alhaji Abubakar Sani Bello (right) and Jigawa State Governor, Alhaji Badaru Abubakar during the 8th Bola Tinubu Colloquium as part of activities to mark Tinubu’s 64th Birthday at the International Conference Centre, Abuja, on Tuesday, March 29, 2016. 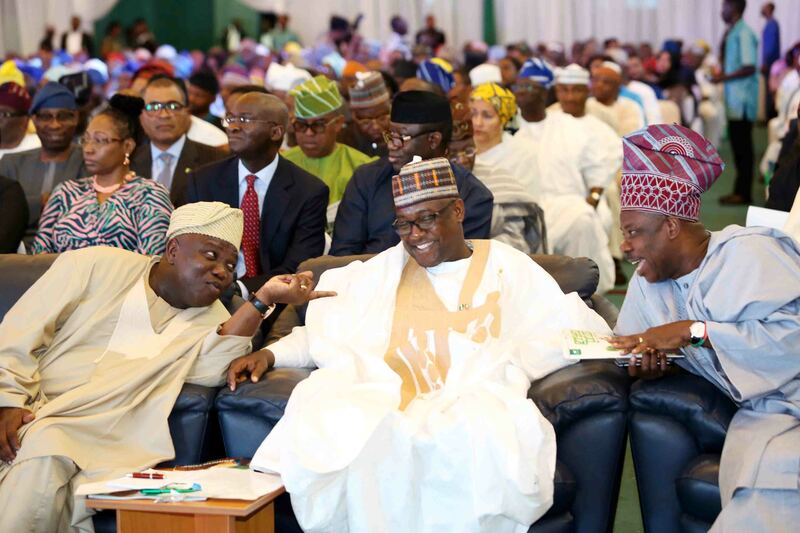 L-R: Lagos State Governor, Mr. Akinwunmi Ambode, with his Niger & Ogun States Governors, Alhaji Abubakar Sani Bello and Senator Ibikunle Amosun during the 8th Bola Tinubu Colloquium as part of activities to mark Tinubu’s 64th Birthday at the International Conference Centre, Abuja, on Tuesday, March 29, 2016. 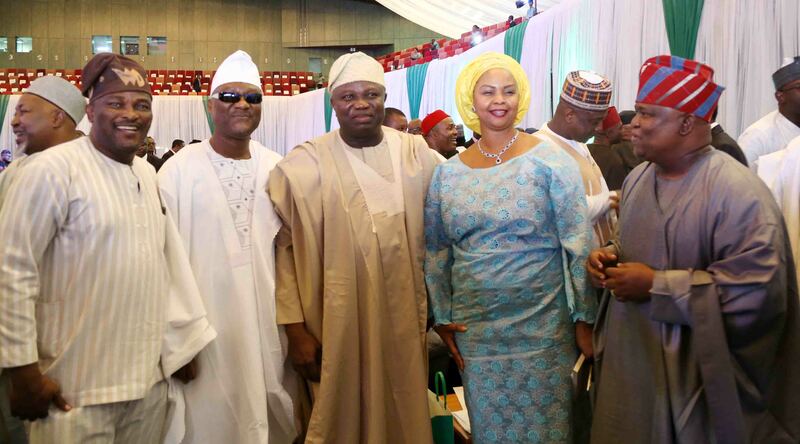 L-R: Lagos State Governor, Mr. Akinwunmi Ambode (2nd right), Osun State Governor, Ogbeni Rauf Aregbesola; his Jigawa State counterparrt, Alhaji Badaru Abubakar; the Celebrant and National Leader of the All Progressives Congress, Asiwaju Bola Tinubu and member, House of Representatives, Hon. Rotimi Agunsoye during the 8th Bola Tinubu Colloquium as part of activities to mark Tinubu’s 64th Birthday at the International Conference Centre, Abuja, on Tuesday, March 29, 2016. 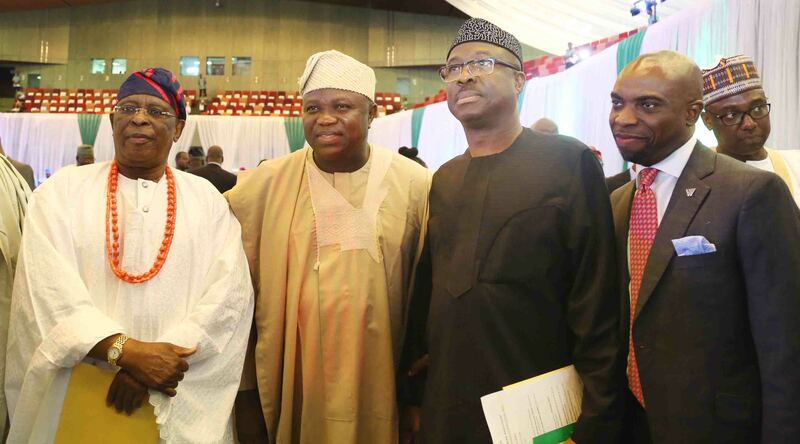 L-R: Lagos State Governor, Mr. Akinwunmi Ambode (2nd left), with former Ogun State Governor, Chief Olusegun Osoba and former Ekiti State Governor, Otunba Niyi Adebayo during the 8th Bola Tinubu Colloquium as part of activities to mark Tinubu’s 64th Birthday at the International Conference Centre, Abuja, on Tuesday, March 29, 2016. 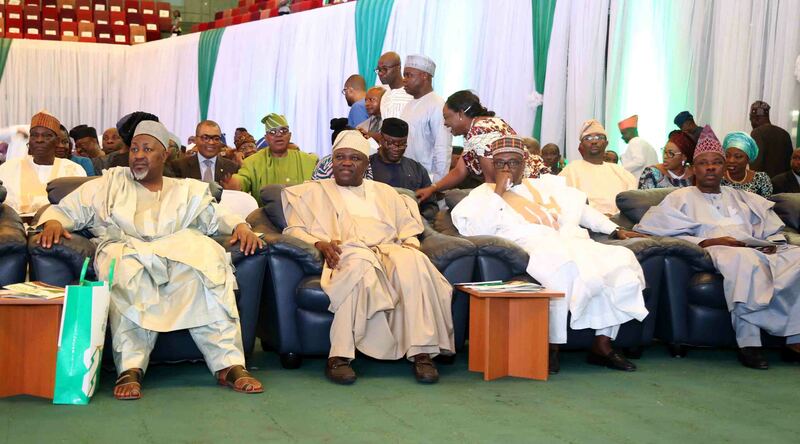 L-R: Lagos State Governor, Mr. Akinwunmi Ambode (2nd left), his Jigawa State counterpart, Alhaji Badaru Abubakar; Niger State Governor, Alhaji Abubakar Sani Bello and Ogun State Governor, Senator Ibikunle Amosun during the 8th Bola Tinubu Colloquium as part of activities to mark Tinubu’s 64thBirthday at the International Conference Centre, Abuja, on Tuesday, March 29, 2016. 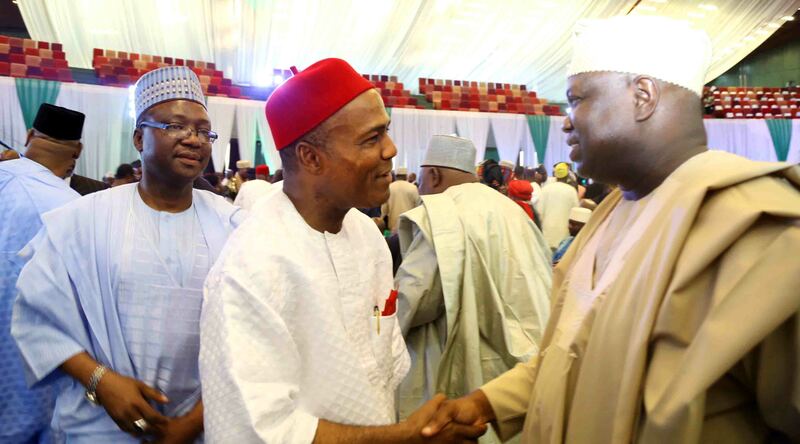 L-R: Lagos State Governor, Mr. Akinwunmi Ambode (right), in a warm handshake with Minister of Science & Technology, Dr. Ogbonnaya Onu during the 8th Bola Tinubu Colloquium as part of activities to mark Tinubu’s 64thBirthday at the International Conference Centre, Abuja, on Tuesday, March 29, 2016. Lagos State Governor, Mr. Akinwunmi Ambode (middle), with Senator Adeola Olamilekan (right); members, House of Representatives, Hon. Samson Bamidele Baderinwa (2nd left)and Hon. Oyewole Babafemi Diya (left) during the 8th Bola Tinubu Colloquium as part of activities to mark Tinubu’s 64th Birthday at the International Conference Centre, Abuja, on Tuesday, March 29, 2016. 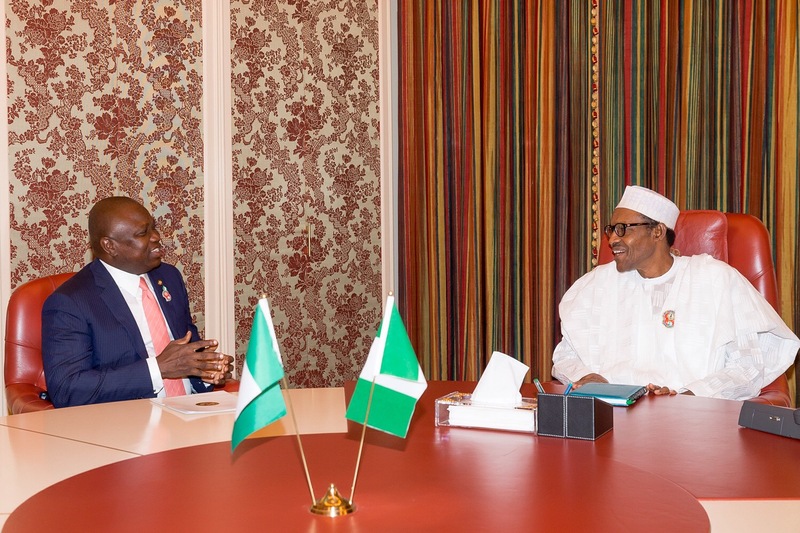 Lagos State Governor, Mr. Akinwunmi Ambode, at a meeting with President Muhammadu Buhari at the Aso Rock Villa in Abuja on Monday, January 11, 2016. 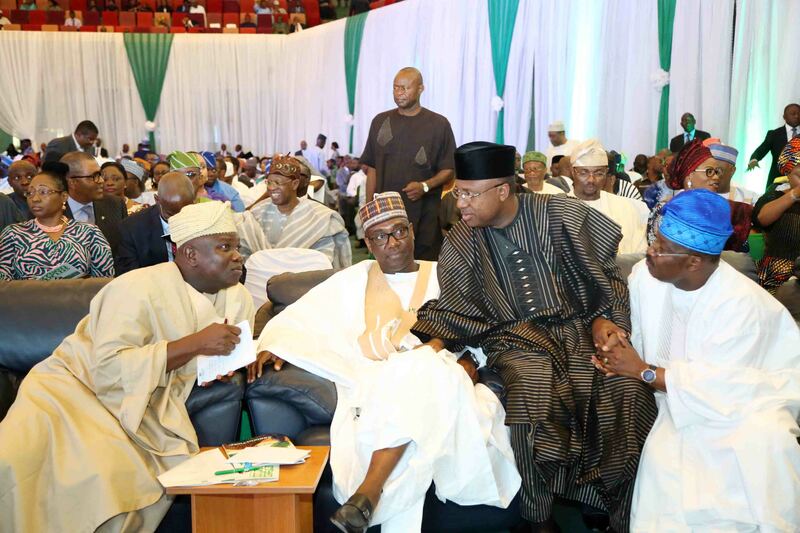 L-R: Lagos State Governor, Mr. Akinwunmi Ambode, his Kwara and Akwa Ibom State counterparts, Alhaji Abdulfatah Ahmed and Mr. Emmanuel Udom during the NEC meeting at the State House, Abuja on Thursday, September 17, 2015. 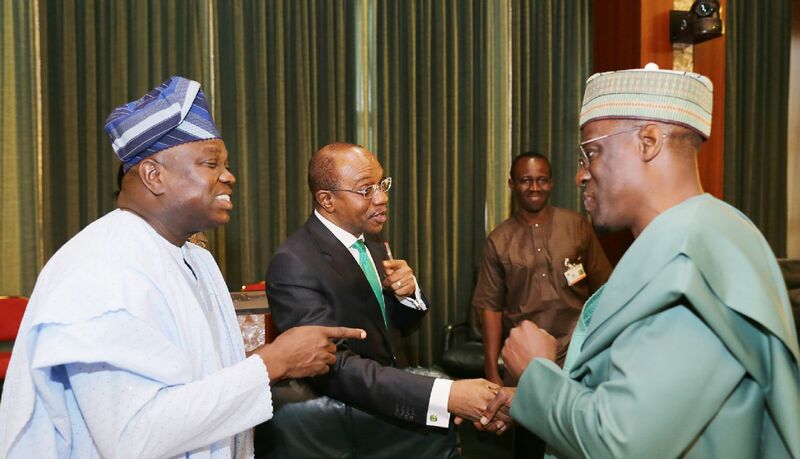 L-R: Lagos State Governor, Mr. Akinwunmi Ambode, Governor, Central Bank of Nigeria, Mr. Godwin Emefiele and Governor of Kwara State, Alhaji Abdulfatah Ahmed during the NEC meeting at the State House, Abuja on Thursday, September 17, 2015. 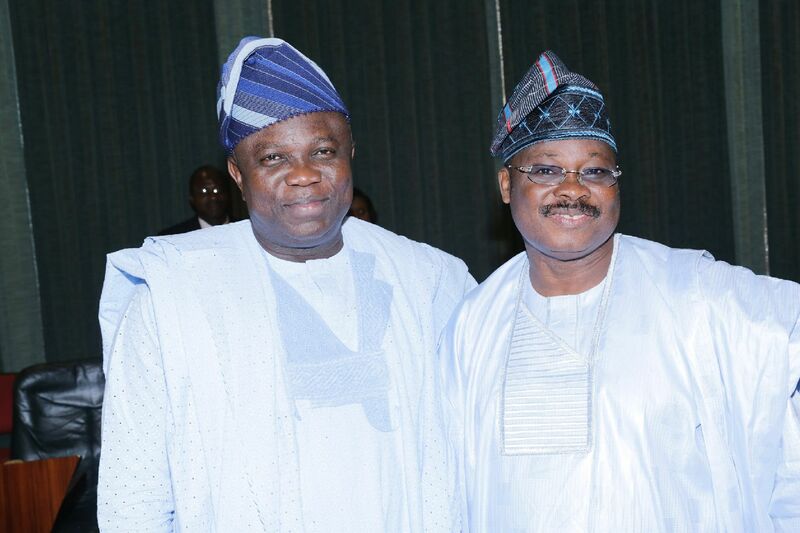 Lagos State Governor, Mr. Akinwunmi Ambode with Governor of Oyo State, Mr. Abiola Ajimobi during the NEC meeting at the State House, Abuja on Thursday, September 17, 2015.